All Web addresses mentioned were functional as of 3-10-17. From the Cumberland Gap to the Atlantic Ocean, this is Virginia Water Radio for the week of March 13, 2017. SOUNDS – ~ 6 sec – Crowd gathered for January 18, 2017, meeting of the Virginia House of Delegates’ Natural Resources Subcommittee. This week, we drop in on a tightly packed room spilling into a hallway of a historic building in the heart of Richmond, Virginia. In this room and others like it, people from various backgrounds gather to express concerns, clarify uncertainty, and work towards compromise. Have a listen for about 90 seconds to an abbreviated version of what was in fact a 30-minute conversation, and try to figure out what’s going on! You’ve been listening to a discussion in the January 18, 2017, meeting of the Natural Resources Subcommittee, part of the Virginia House of Delegates’ Agriculture, Chesapeake, and Natural Resources Committee. In the audio you heard, this subcommittee was discussing House Bill 1679, related to chemicals used in the hydraulic fracturing for natural gas. In a subcommittee, members meet with stakeholders from across the Commonwealth to discuss legislation. Subcommittees are usually the first place where proposed bills get thoroughly debated at the General Assembly, so their meetings can draw a passionate and heated crowd. Subcommittees are the place to discover the issues of a bill, and clarification is the name of the game at this level. What happens here is crucial to whether or not proposals move forward from committees to House and Senate floors and ultimately to the governor’s desk. So if someday in January or February you find yourself at the Virginia General Assembly, try to drop into a subcommittee meeting. You may not have enough room to move, and you may find yourself standing in the hallway or sitting on a table rather than a chair. But even if you’re crowded, you’ll be sure to witness the interpersonal, relatively informal, and occasionally humorous side of Virginia law-making. Thanks to this week’s guest host, Eryn Turney, the spring 2017 intern at the Virginia Water Resources Research Center. We close with the words of James Edmunds, the chair of the Virginia House of Delegates’ Natural Resources Subcommittee. This week’s audio was recorded by Virginia Water Radio at the January 18, 2017, meeting of the Natural Resources Subcommittee of the Virginia House of Delegates’ Committee on Agriculture, Chesapeake, and Natural Resources. The excerpt you heard was a montage of comments in the original sequence but not the original timing. An audio recording (30 min./31 sec.) of the subcommittee’s full discussion of House Bill 1679 on January 18, 2017, is available at this link. For more on 2017 General Assembly bills on hydraulic fracturing chemicals, please see the Virginia Water Central News Grouper post, Water in the 2017 VA General Assembly: Fracking Chemical Disclosure Bills – Updated February 21, 2017. An excerpt of the January 18 subcommittee meeting was also featured in Episode 353, 1/30/17. 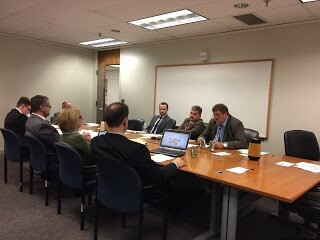 Meeting of the Virginia House of Delegates’ Agriculture, Chesapeake and Natural Resources Committee/Natural Resources Subcommittee, in Richmond on January 18, 2017. The Virginia General Assembly convenes every year in January. In all even-numbered years, the Assembly holds a so-called “long session” of 60 days; “short sessions,” initially set for 30 days but typically extended to about 45 days, are held in odd-numbered years. A reconvened (“veto”) session is held in April. During long sessions, the Commonwealth’s budget for the upcoming two years is set; amendments to the current biennial budget may be considered both in long and short sessions. The General Assembly’s main Web page is http://virginiageneralassembly.gov/index.php. Standing committees are key parts of the General Assembly process. Proposed legislation is assigned to a committee, then possibly to a subcommittee. The House of Delegates has 14 standing committees, while the Senate has 11. Most of these groups meet weekly during the General Assembly session. Information about all standing committees—including membership, meeting times, and legislation being considered—is available from the Virginia Legislative information System, online at http://lis.virginia.gov/lis.htm. Two committees that receive many water-related bills are the House Agriculture, Chesapeake and Natural Resources Committee (House ACNR) and the Senate Agriculture, Conservation and Natural Resources Committee (Senate ACNR). The House ACNR Committee includes three subcommittees: Agriculture; Chesapeake; and Natural Resources. The Senate ACNR does not include any subcommittees. Energy-related bills may be assigned initially to the House or Senate Commerce and Labor Committees, both of which (as of 2017) have energy-related subcommittees. Virginia Legislative Information System, “2017 Session: House Bill 1679,” online at http://lis.virginia.gov/cgi-bin/legp604.exe?ses=171&typ=bil&val=hb1679. Virginia Legislative Information System, “2017 Session: Members of the General Assembly,” online at http://lis.virginia.gov/171/mbr/MBR.HTM. Virginia Water Resources Research Center/Water Central News Grouper, “Water in the 2017 VA General Assembly: Fracking Chemical Disclosure Bills,” online at https://vawatercentralnewsgrouper.wordpress.com/2017/01/31/water-in-the-2017-va-general-assembly-fracking-chemical-disclosure-bills/. Virginia Water Central News Grouper posts on the Virginia General Assembly (from 2012 to 2017) are available online at https://vawatercentralnewsgrouper.wordpress.com/?s=General+Assembly. All Water Radio episodes are listed by category at the Index link above (http://www.virginiawaterradio.org/p/index.html). See particularly the Community/Organizations subject category.